As an artist, most of the time you’re simply looking to catch fire with a couple tracks and make a few bucks. The process of becoming a legend, or synonymous with a certain genre of music takes a long time, more than most bands stay committed to their craft. Today’s artist may be the most identifiable with a type and style of all time—and that’s saying something. Robert Marley was born in February of 1945 on his grandfather’s farm in Jamaica. Dad was considered a ‘white Jamaican’ originally from Sussex, England and worked as a plantation overseer; Robert’s mom was of full Jamaican decent and 41 years younger than his dad. While his father provided financial support, he was seldom present to raise Robert. When Robert was 10 years old, his farther passed due to heart attack at age 70. His mom got remarried to an American civil servant who had two boys of his own. Robert met a friend named Neville Livingston and began playing music together in primary school. Robert left the area at age 12 and moved to Trenchtown. Neville’s dad and Robert’s mom ended up having a child together, so it would come full circle and they’d all end up living under the same roof. That action resulted in big changes in Marley’s musical aspirations since they could now practice and jam anytime they wanted. They’d join up with a group of people in the early 60’s and form a band. They’d go on to name themselves Bob Marley and the Wailers, getting signed to a small label. The road was not smooth for the band however, and establishing themselves in the mainstream would prove difficult. In 1966 Bob married Rita Anderson and moved to Delaware. He even took a job at the Chrysler plant under the alias Donald Marley. It was around that time he turned to Rastafari beliefs and began growing the signature dreadlocks. Finally in 1970, his focus was fully back on music and big things were about to happen. In 1972, Bob signed sign Island Records and the sales and distribution strategy changed drastically. 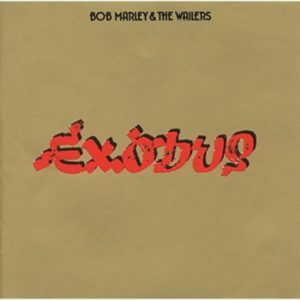 Today I’m listening to the ninth studio release Exodus which came out in June of 1977. In spite of being a reggae album, there are elements of blues, soul, rock and funk. Previous albums focused on story-telling, maybe in a bit too cryptic of a fashion, where this was a bit more transparent. Talking about religion, politics and world change. Sales and critical response was very positive at the time, and would continue over decades. From 1991 through 2007, Bob Marley sold well over 20 million albums. In 1999 Time magazine named Exodus the best album of the 20th century. VH1 called it the 26th greatest album of all time and Rolling Stone had it #169 on their 500 best of all time. Very serious praise. In late 1976, Marley survived an assassination attempt believed to be politically motivated, his music and his status became recognizable throughout the world. Sadly just after the release of this album, Marley was diagnosed with melanoma under a toenail. He turned down advice to have the toe amputated, which led to the cancer eventually spreading to his brain and lungs. Marley passed away in 1981 at age 36. He left behind a legacy not only within his music, but his religious beliefs, his humanitarianism and fights for peace; the man is truly a legend. This is merely scratching the surface of the life and career of Bob Marley—but I would certainly encourage anyone to give his music a chance. Maybe the laid back nature isn’t for everyone, but there’s a vibe on here for any taste. For $5 bucks, pick up Exodus as a tribute to one of the biggest names in music history.